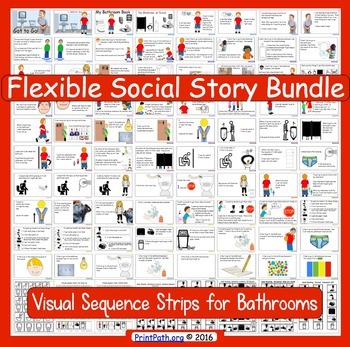 Flexible Bathroom Social Stories for children with autism, sensory processing disorder, and other developmental difficulties. Learning to use the bathroom at school can be a struggle for children on the spectrum. Social stories and visual task strips are the most effective methods of teaching new self-help skills to many special needs children. Use of social stories are judged by teachers to be either highly effective or somewhat effective at 97% (Reynhout, G. & Carter, M. 2009). But because individualized visuals are so time consuming and difficult to make they are often left on the to do list! With this product I have included a comprehensive number of scenarios, and made them readily available and accessible to parents, special education teachers, and occupational therapists. 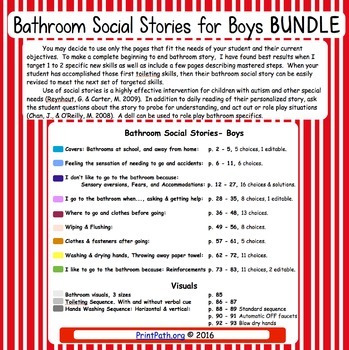 Every child is different and as special educators we see many different bathroom issues during the elementary years. Choose from 7 book covers, 76 separate book pages with a corresponding visual to aid understanding, and 8 visual sequence strips for posting. Pick only the pages for your student’s needs. Specific sensory aversions that make it difficult for children with autism or anxiety issues to use new bathrooms are included. Clear consistent visual expectations as well as specific accommodations help make bathroom use successful! Editable text is available on one cover and four pages so that you can add your student’s name and specific circumstances that are important in your situation. Both photographs and clip art are used. This product is easy to use because of the detailed table of contents. Just read the table of contents and pick the pages that you need to print. You choose the cover and pages that fit the needs and issues your boy is dealing with now. Prioritize the problems. Pick only one or two issues that interfere the most, and after they are addressed, revise your book to help address the next issue. To make a complete beginning to end bathroom story, I have found best results when I include a few pages describing mastered or assisted steps as well. Materials are designed for boys 3 to 12 years old. You may be interested in Tips for parents and teachers on how to make the process of using public bathrooms fun, interesting, and successful. Blog post @ by Print Path. Covers: Bathrooms at school, and away from home: 5 choices, 1 editable. Feeling the sensation of needing to go and accidents: 7 choices. 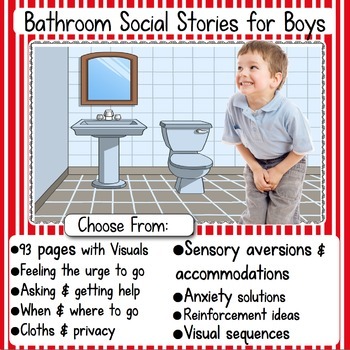 I don’t like to go to the bathroom because: Sensory aversions, Fears, and Accommodations: 16 choices & solutions. I go to the bathroom when..., asking & getting help: 8 choices, 1 editable. Wiping & Flushing: 8 choices. Clothes & fasteners after going: 5 choices. Washing & drying hands, Throwing away paper towel: 11 choices. Bathroom visuals: 2 choices, 3 sizes. Hands Washing Sequences, Horizontal & vertical: 3 choices each. If your child has an issue that is not addressed in this product email me info@printpath.org after purchase to request a page or pages for your child! ★ Used this immediately with one of my students. This had a huge impact. Thank you! ★ This is great for boys who have the ability to be toilet trained but aren't consistent. It's incredibly thorough in explaining all steps and addressing any possible barriers to consistency. ★ This has been a perfect tool to use with one of my high school students. And it was easily customized for home as well. ★ Great!! I love that I have so many options! I can customize each book based on specific students' needs. ★ This is perfect for my kindergartners! I love that it is editable! ★ This was absolutely worth every penny! I had to modify some of it since I work in home care (so instead of school/class settings, I made it home setting). Besides that, it was absolutely perfect. So glad I found it! ★ These are great and I love that I can swap in and out pages as needed. ★ This was exactly what I needed. It has so many options to meed any one's needs. ★ Thank you for this product! has every step you could need..and more ! ★ As a first year teacher this has helped so much! Great resource! ★ Love the editing feature! ★ This is a time and life saver. ★ Great comprehensive social story! Wonderful resource!